On the occasion of the BaselWorld 2014 trade show, Roger Dubuis announced that a special limited edition Hommage Minute Repeater model will be joining its most exclusive Hommage collection, a range that exemplifies the epitome of precise mechanics. The homage collection, which pays a tribute to the Manufacture’s founder Mr. Roger Dubuis, welcomes 8 limited edition watches made of pink gold. The new model is described as a symbol of the master watchmaker himself, which is something that reflects both in its depth and in its strong character. Roger Dubuis Hommage Minute Repeater is a rather large watch that measures 45mm in diameter. Its elegantly polished case houses the in-house caliber RD08, which is an automatic mechanical movement equipped with the Maison’s emblematic double micro-rotor in platinum. In addition to the basic time telling functions, the Hommage Minute Repeater integrates one of the most complex feats of haute horlogerie – a minute repeater with a centrifugal sound diffuser. What makes this movement even more exclusive is the fact that it represents one of the handful of automatic minute repeaters equipped with a double micro-rotor, and that it actually is the one and only repeater of its kind to bear the prestigious Geneva Seal (Poinçon de Genève). The centrifugal sound diffuser, mentioned above, is a mechanism positioned between two hammers, which serves to normalize the inertia, control the cadence of the chime, and ensure that only melodious and clear sounds are heard. Visible at the 5 o’clock position is the flying tourbillon, a mechanical addition to the escapement that alleviates the effects of gravity and improves the accuracy of the watch. The tourbillon is supported only from one side, and it appears as if suspended in mid-air. A discerningly openworked dial certainly contributes to this impression, while maintaining the symmetry and coherence of its elements. The RD08 movement beats at 21,800 vibrations per hour and provides around 60 hours of autonomy. This highly complex mechanism is built on 415 individual components and its production requires no less than 11,250 hours of dedicated work. At least 380 hours of manufacturing are dedicated solely to the Geneva Seal. 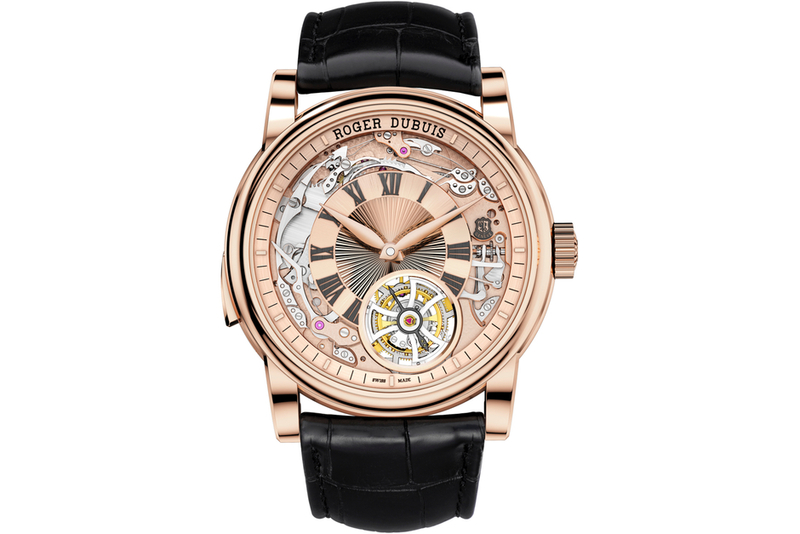 The limited edition Roger Dubuis Hommage Minute Repeater is referenced as RDDBHO0560. The watch is mounted on a luxurious black leather strap with gold folding buckle, and it retails at $419,000.